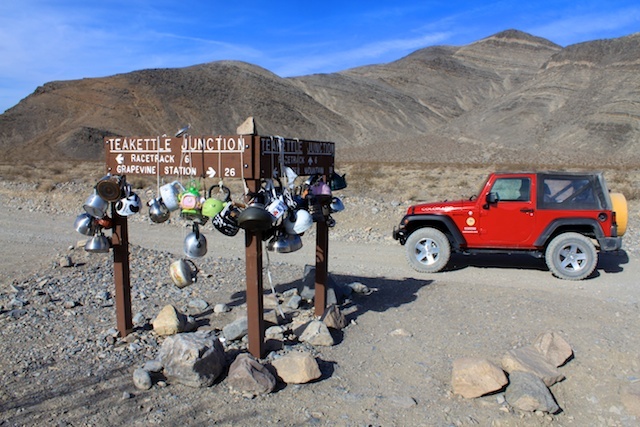 Teakettle Junction is one of those unique places in the middle of nowhere that draws visitors see it while on the road to the Racetrack Playa. Not a lot of history is known about this location, but a couple of locals told me that it is said to have been put here to show early settlers that there was water nearby. I don’t know how true that is as we saw no water, or even signs of water the entire time we were here, but regardless it is an interesting site. 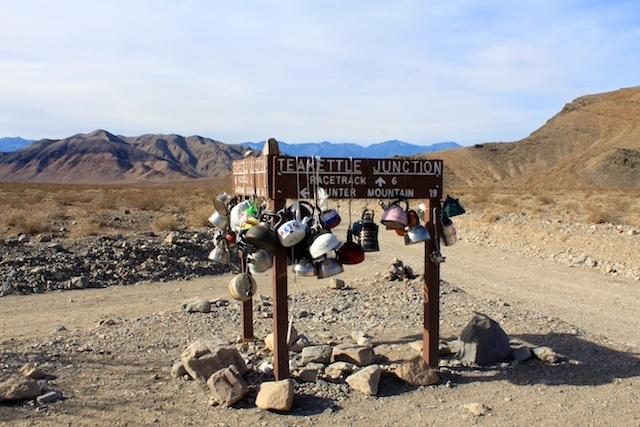 Teakettle Junction marks the 21st mile on the Racetrack Road, as you are making your way to the dry lakebed where the rocks seem to move on their own. It is also the intersection where you can turn off to make your way up to Lost Burro Mine and explore some of the neighboring mountains. It should be noted that all of this is only accessible via a vehicle with four wheel drive as you must drive 21 miles down a dirt road to even get to the junction. 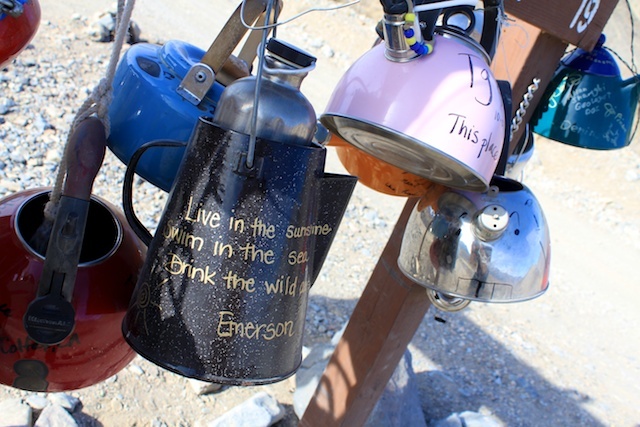 The tradition is to bring a new teakettle and to either inscribe your message on it or to write a letter and put it in it. This is said to bring good luck to those that leave a kettle and to provide an exciting sign for future travelers. I found this junction a lot of fun and enjoyed checking it out. It is a perfect place to stop during your trip to the racetrack as it lets you get out of the car and stretch while checking out this unique site. Also of note, many phone carriers will have service in this area, in case you needed to reach someone or were stranded while driving. I’m sure the service is poor, and there is no guarantee it will be there when you go, but when I was there with AT & T, I had bars. It was good to know I could make a call here if needed. 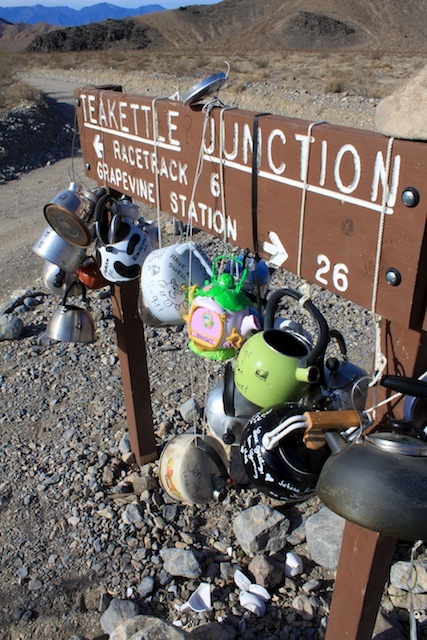 Why are there sometimes no tea kettles at Teakettle Junction? 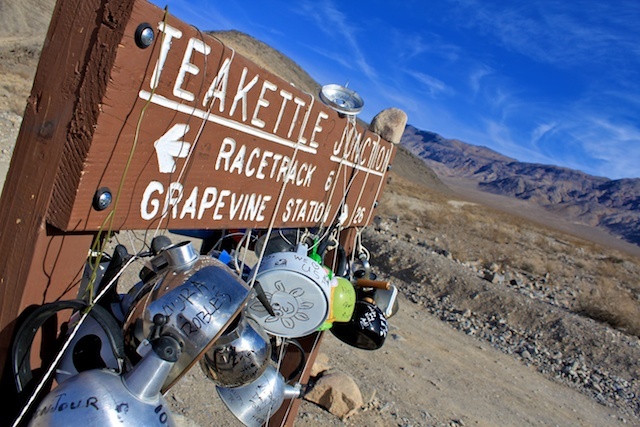 I was told that a couple of times a year the locals would go out and clean off the tea kettles to give them back out to the wanders making their way out to the junction. This is done so that everyone can be involved and add a kettle even if they didn’t bring one. I am not 100% sure this is the case, but that is what I have been told. 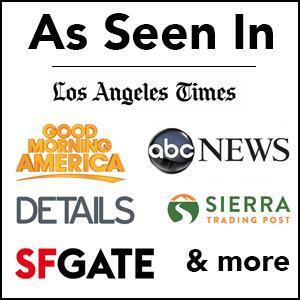 Let me know what you think in the comments and check out the other posts on Death Valley as well.